On Tuesday 22nd October, subject to weather, contemporary artist, Dmitri Galitzine, will be attempting to cross from Portsmouth to the Isle of Wight in a giant pumpkin. Galitzine will sit inside the vegetable and travel several miles across one of the busiest shipping channels in the world. 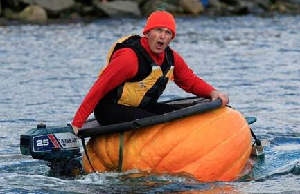 The pumpkin will be fitted with a small outboard motor and will travel at a speed of about 1 or 2 knots. It is the first heroic attempt in history to cross the Solent in a gourd.The starting point for the epic (some would say foolhardy) journey is Trafalgar Wharf in Portsmouth, where the pumpkin will be prepared, tested and made seaworthy. A tenant of Trafalgar Wharf, Crystal Covers, will make the spray deck to keep out the waves. “Despite weighing 500kg, giant pumpkins are naturally buoyant and have a thick waterproof exterior. They are round in shape like Welsh coracles, which were an effective vessel in fast flowing rivers. My biggest challenge are the strong tides across the Solent,” said Dmitri Galitzine. And as if the sailing across the Solent in a bright orange vegetable isn’t madcap enough, Galitzine will be trying for a double record attempt with a 100 metre dash on Wednesday 23rd October at 1300 in Trafalgar Wharf's new marina next to The Drystack.